The discussion swings from hot shots to hot flashes, calving ease to grandkids, corn yields to cornbread recipes. At the Nebraska Women in Agriculture conference, all the topics focus on agriculture, but it’s in a language that’s specific to women. 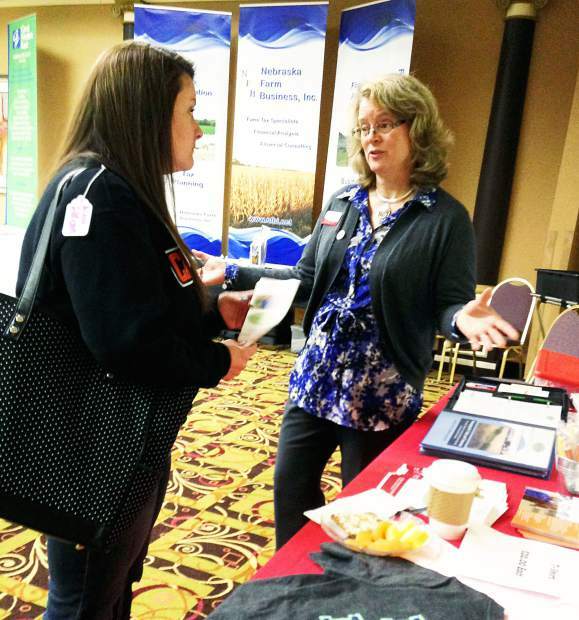 Feb. 26 and 27, about 350 women from across Nebraska and surrounding states met in Kearney to learn, network and celebrate 30 years of bringing women in ag together at the annual conference. Kayla and Bobby Anderson, sisters-in-law from Elm Creek, Nebraska, attended their second Women in Ag conference this year. They go to learn more about the businesses they married into. “I did it so I could kind of understand my husband’s operation and role. So when he talks I can understand what he’s saying. I didn’t grow up in farming,” Bobby said. They both said the conference helps them have more educated conversations with their families about their businesses. “I want to get more involved in decision making and the reasons behind the decisions. If it’s ever our call we can make an educated decision,” Kayla said. She and Bobby feel like they can take new ideas back to the family business and start new conversations. “Most of the time they’ve already heard about it, so then they look at what we learned and kind of put it against what they know and if something differs, it leads to more research,” Kayla said. Conference sessions this year covered farm programs, crop disease, grain marketing, ag-related apps, minimizing losses, GMOs, water resources, succession planning, beef cattle markets, soil health, body condition scoring, emerald ash borers, disaster preparedness and Alzheimers, among others. The original WIA conference featured 10 sessions. This year participants could choose from more than 30 different topics. Cheryl Griffith, the coordinator for the Women in Ag program for Nebraska Extension, said they try to deliver speakers and sessions that address the real concerns for women in agriculture. They base their decisions on the evaluations from previous years and focus groups they conduct with producers around the state. “My benchmark is if it’s something a producer is going to take home and maybe sit at the kitchen table and discuss with their partner and maybe make some changes to their operation. We want it to be good, useful, practical information,” Griffith said.